I saw “Inside Out” at a free pre-screening w/ my movie Meetup (all ladies) and a large group of press folks (who were pretty quiet during the film, which is common). Before the main attraction, we saw a short film (“Lava”) about a lonely volcano that wants to have someone to love. I’m NOT sure if this story was based on a Hawaiian folk tale. There was a song all through the short, which was cute and catchy. I went in NOT knowing much about the film, BUT I liked it! Some critics say it’s the best thing since “Toy Story,” which was a big hit for Pixar. I suggest it for kids 10 and up, especially, as it deals w/ themes that MAY go over the heads of the younger crowd. There is also a LOT for grown-ups to enjoy. Riley, an 11 y.o. girl, goes through a period of displacement and sadness after moving from her suburban home in Minnesota to an apartment in San Francisco. 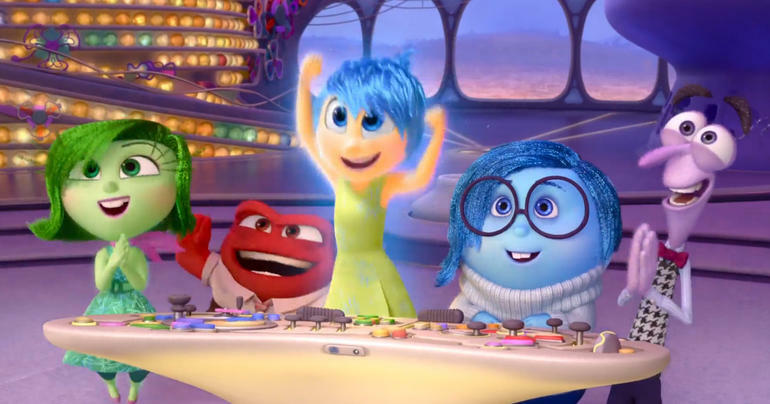 Aside from Riley, the main characters are the emotions inside her head: Joy (Amy Poehler), Sadness (Phyllis Smith), Anger (Lewis Black), Disgust (Mindy Kaling), and Fear (Bill Hader). I wanted to see this mainly b/c I’m a fan of Black and Kaling. In the beginning, everyone was bummed out by how Sadness (who is blue, wears a turtleneck) was acting, BUT we know that people can’t always be happy. Riley has to get used to her new room, new school and classmates, and missing her best friend. 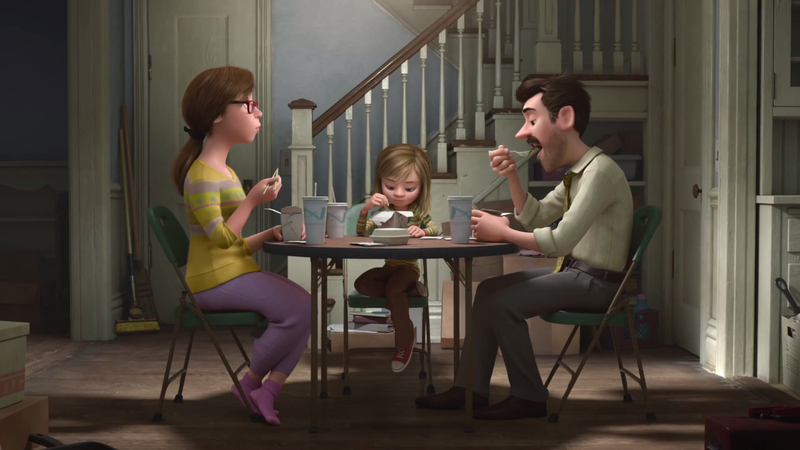 She finds it VERY difficult to be her usual positive self, even though she knows that’s what her parents (voiced by Diane Lane and Kyle McLachlan) want. Joy tries hard to get Sadness out of the way, BUT an accident pulls these two main emotions away from the control room.